In 2012 Jeffrey Gold met Jeff Beri. Jeff Beri is a Master Jewel/Designer who also views the world as a place of beauty. He has a strong fashion background and has created collections for the finest global jewelry houses including David Yurman for both women and men. Jeffrey and Fred are now collaborating on a new collection with Jeff Beri called "Hand to Hand". Jeffrey and Fred are very excited to work together with Jeff Beri as he brings his vast knowledge, experience, and sensibility of jewelry to the group. Jeffrey Beri and Jeffrey Gold are two world class artists who are now collaborating to create the first collection of wearable art. Welcome to the Hand to Hand Collection. Jeffrey Gold is a uniquely talented old breed artist whose creative expression previously was fulfilled with brushstrokes on canvas but is now found forming wax for the finest metals and most precious stones for jewelry. His vision is that of a true artist: to create unparalleled beauty using hands as a canvas to celebrate the spirit of life. Jeffrey Beri is a classically trained jeweler schooled in Europe who also views the world as a place of beauty. He has a strong fashion background and has created collections for the finest global jewelry houses including David Yurman for both women and men's. He is regarded as both a premiere jeweler and an excellent craftsman as he knows what metals and stones can be sourced and produced with flawless precision for maximum aesthetic impact. Jeffrey Gold and Jeffrey Beri met in Los Angeles through a close mutual friend. They are now partnering to create the first ever collection of wearable art with the focus of it being entirely made in America. 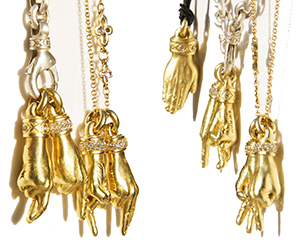 Fine jewelry will never be the same with the launch of The Hand to Hand collection. For the last year, Jeffrey Beri built out a design studio with the same attention to world class jewelry production standards that he has utilized for over two decades. Within this studio, Jeffrey Gold has painstakingly worked day and night to create one of a kind works of art in the finest metals and globally sourced precious and semi precious stones lovingly shown on unique beaded or leather chains. The vision of the Hand to Hand studio would be that of a turn of the century Left Bank Parisian artist's loft transported through time and across the Atlantic. Artistic originality is married with modern world production expertise with flawless precision. Each finished and artist approved creation is signed and numbered with authenticity cards with the end result being true wearable art. Two artists combining to express the human emotion through wearable art. Made in America. One of a kind collectibles. A new category of jewelry is now born with The Hand to Hand Collection available in the finest stores in The United States.